A 55-minute documentary about Hans Rosling’s life & thoughts. Hans Rosling is a professor in international health. His presentations on global development evokes laughter, rejoice and reflections. He wants everyone to question their prejudices about the world – as he himself has needed to do. A documentary by Pär Fjällström, SVT. 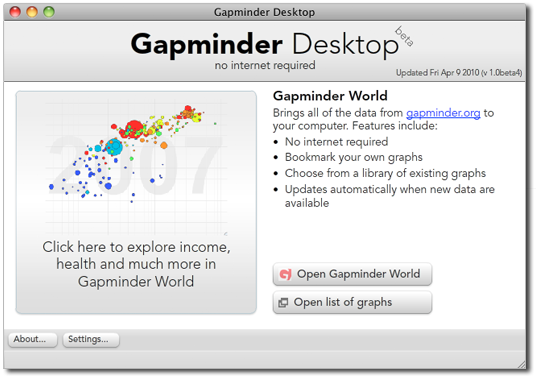 Google Public Data Explorer, a new powerful visualization tool that lets you explore, visualize and share data in a “Gapminder-like” manner, was launched by Google earlier this week. The new tool lets you explore data from a number of data providers such as World Bank, EuroStat, U.S. Bureau of Labor Statisitics and U.S. Census Bureau through “Bubble-charts”, maps, bar- or line charts, that you can share on your blog, web page or other media. 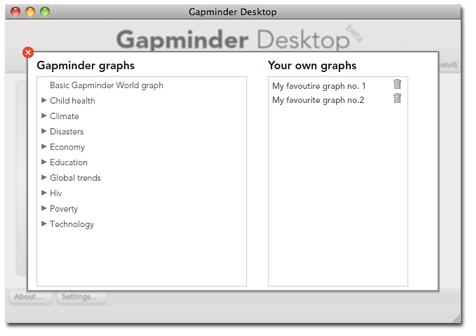 Three years ago, Google acquired Trendalyzer – the technology behind Gapminder World – from Gapminder. Since then, they have launched Motion Chart (a gadget that lets you make charts from you own data) and a public data search function that make it easier to find public data in a normal google search. The new Public Data Explorer is still a Google Labs-project, which means that it is till work in progress. We hope that more data providers will make their data available through this technology to increase the use of data in the general discussion about the world. The role of geography for the prospects of development has been hotly debated the last decade. Economists, like Jeffrey Sachs, have suggested that a country that are situated in the tropics or that are landlocked face a much larger challenge in development, for a number of reasons. Cervical cancer is common among middle-aged women. It is caused by a sexually transmitted papillomavirus that causes a lesion in the lower part of the uterus that, in some women, can develop into cancer. By introducing screening test, so called ”pap smear test”, many countries have managed to reduce the number of women affected by cervical cancer dramatically, and by doing so saving thousands of women every year. Unlike some other cancers (e.g. breast cancer) cervical cancer is decreasing with higher income. In this video Hans Rosling compare two nordic countries, Denmark and Norway that, at different times, introduced the Pap smear screening and the effect it has had on the number of women who got cancer. Cervical cancer and income in the whole world. See the development of three centers of trade, Shanghai, New York and Mumbai. Also, a comparison of the capitals: Beijing, Washington, D.C. and New Delhi. And finally, a note from Professor Rosling on how one can measure the progress of President Obama’s intentions to improve the health system of the US.